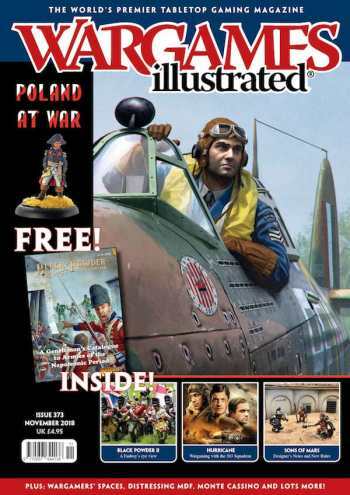 In the current issue of Wargames Illustrated magazine (WI373, November) a group of hardened campaigners discuss the relative merits of bringing their experience as re-enactors to the tabletop and vice versa. A special look at what we ‘Spotted At’…the Colours show in Newbury, UK, plus a close up on what was in the cabinets at the last Warlord Open Day! Colonel (Retd.) Bill Gray looks at the impact of the Husaria on the tabletop battlefield. Steve Wood, ardent fan of the Black Powder rules, takes a critical look at what’s new and worth noting in the new edition. Some hardened campaigners discuss the relative merits of bringing their experience as re-enactors to the tabletop and vice versa. Military historian Vincent Rospond charts the rise of the Polish Legion during the period of the Revolutionary and Napoleonic Wars. Following the success of his recent three part series on painting and modelling with MDF buildings, we asked Gary Faulkner to “give us more!” and he has obliged…. The team behind the popular By Fire and Sword rules tell us about their plans and provide an insight into their company. The latest installment in author Steve Tibble’s quest to bring a more accurate Crusade to the world of wargaming. Vincent Rospond continues the story of the Polish Legion, focusing on their service during WWI and its aftermatch. A close look at the ideas behind the creation of this gladiatorial combat game, plus some exclusive new rules content. In this article Dom Sore discusses the contribution made by this unit of Polish exiles in the defence of Britain and their efforts to hit back at Germany. Paul Leach takes us to the edge of Apocalypse and beyond. Dom Sore looks at the contribution made by Polish troops during the bloody assaults at Cassino during WWII. Bob Murch of the marvellous Pulp Figures provides some guidelines for getting the best from these new figures that support the Flint and Feather ruleset. Ash Baker takes us through his motivations and the design ideas of his recently released Osprey zombie game. Dicky Boyd discusses an educational project for children which used wargaming and operatic music to convey the realities of World War One. David Bickley shows us his small but beautifully formed converted garage come wargames room.